View of Avalon Bay. All photos by Jessica Ritz. That funny little island off the coast of Los Angeles makes for a better vacation than you might have imagined. Local girl Jessica Ritz checks out Catalina and finds it a microcosm of LA, where intrigue and noir meet laid-back beach vibes. CATALINA ISLAND, California – Forget Hollywood. Forget Chinatown. Santa Catalina Island is the stuff LA noir dreams are made of. And it makes for a perfect getaway from Southern California. Located in the Pacific 22 miles from the Los Angeles Harbor breakwater, Catalina is a crazy repository of story-rich goodies. 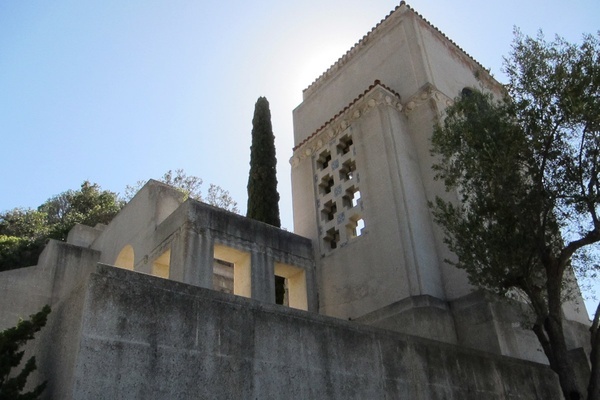 Historically overseen by a private landowning company transferred between filthy rich private owners, the island was incorporated by the Banning family of Los Angeles in 1894. They went broke after the Avalon fire of 1915 and sold a majority interest to William Wrigley, Jr. of the Chicago-based chewing gum empire. 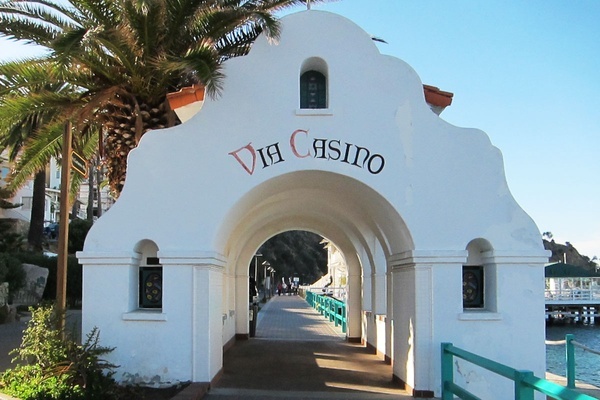 Today, many of the attractions on the island — the hotels, the clubs, the sites — are run by the Wrigley-led Santa Catalina Island Company. Catalina has a small year-round population, a non-stop stream of visitors and employees from the mainland, breathtaking natural beauty, lovely architecture, scarce water resources, and, just for good measure, roaming bison. A quick stroll gives you the lay of the land, and two hours in a golf cart (highly recommended) affords any visitor heaps of island idyll. But it always feels like there's a lot going on beneath the surface on Catalina. Truth might be stranger than fiction in some of its parts, so it's only fitting that the island made an appearance in Roman Polanski's , the ultimate LA noir film. The 76-square-mile landmass is its own cultural mash-up — a mix of wholesome Bedford Falls, laid-back SoCal beach and boat culture, outdoor fervor and old Wild West spirit (Zane Grey was a famed denizen), and a dash of freewheeling Atlantic City-esque boardwalk scene (without the gambling). 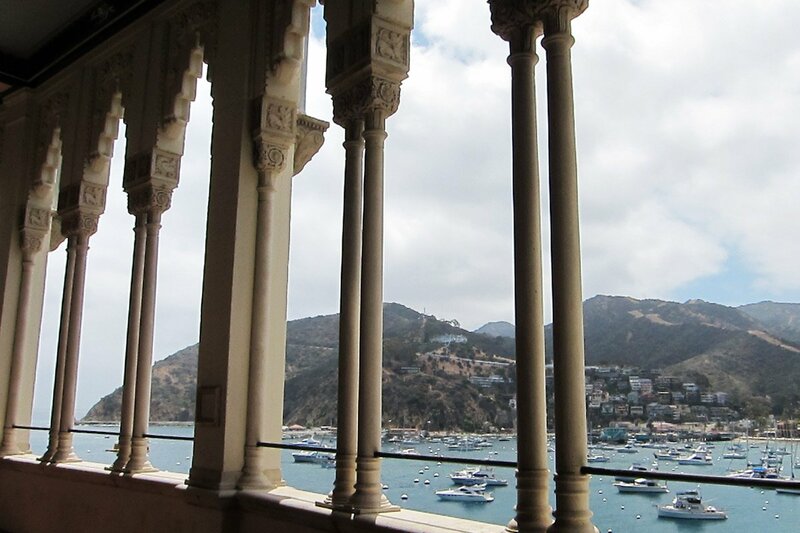 Ironically, Catalina's most iconic location is , a stunning Mediterranean and Spanish Revival-inspired Art Deco landmark commissioned by Wrigley in 1929. 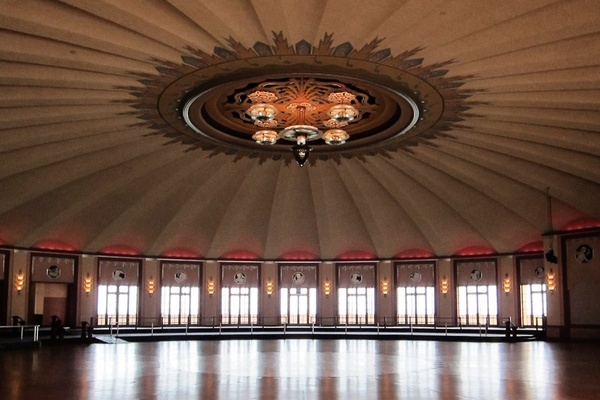 The movie palace and circular ballroom located at the top level still operate to this day. Most of the island action is centered around , a compact town less than three square miles with a population of approximately 4,000, but some visitors opt for complete quiet in remote camping sites scattered throughout the island and near Two Harbors village, accessible via ferry services. A dryer ocean experience is a or . 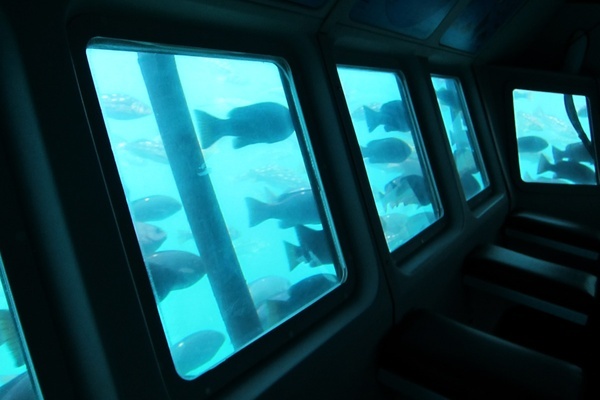 Even the most jaded aquarium-goer can't help but be wowed by swarming fish right outside the slowly cruising vessel's windows. The Catalina Island Company also operates a , with a choice of five routes and various extremes and heights. We weren't sure if the screams we heard overhead were from sheer delight or terror. The interior of the island is open for camping and exploring the wild, and many campsites are owned and managed by — surprise! — the Island Company. Eighty-eight percent of the island's land, however, is under the purview of the , which was founded as a nonprofit in 1972. If roughing it or semi-roughing it isn't your thing, sign up for a with or a trip organized through the Catalina Conservancy. Speaking of delicate ecosystems, the current drought in Catalina is serious business. The island deserves props for the aggressive, no-nonsense messaging to visitors about the severity; it's a tactic other California cities can learn from. But when restaurants offer only bottled water and don't use tap for drinking, it's a bizarre twist in resource allocation (because nothing about bottling and shipping water is good for the environment) and a challenge for those who oppose bottled water on principle. So what's the solution? For now, do as the locals do: BYOB from the mainland. The Wrigley Memorial and Botanic Garden. 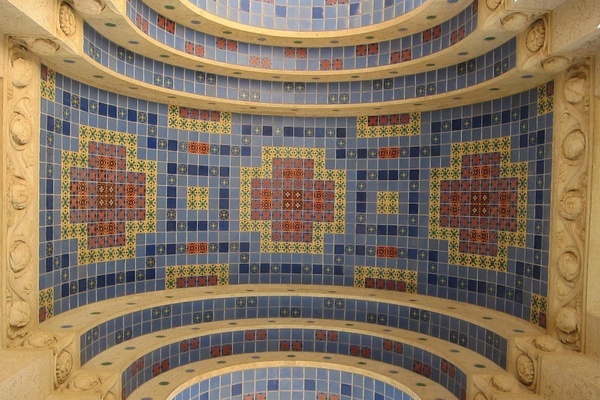 Wrigley and the Island Company founded Catalina Clay Products in 1927 to crank out gorgeous ceramic products that were all the rage at the time — from ornately embellished tiles used to trick out Spanish Colonial Revival manses and bungalows to utilitarian dishes and water jugs. The Casino is home to some of its best specimens, such as the practically NSFW massive mermaid tile mural that adorns the main entrance. on the ground floor of the Casino has lots of Catalina-inspired tile for sale in the gift shop. To get a sense of a meticulous approach to design and construction using Catalina tile and other indigenous building materials, hike or cruise in a golf cart up to the , an eclectic Deco masterpiece. For a contemporary twist, make an appointment with Robin Cassidy of for a studio tour or a hands-on ceramics workshop. 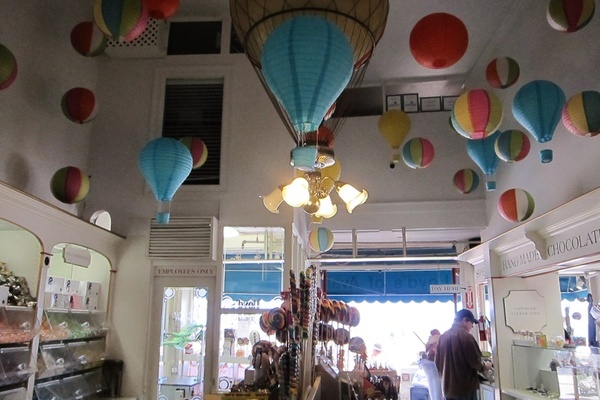 Silver Canyon's reproduction pieces and Catalina vintage pieces are for sale at the souvenir shop along the main drag. 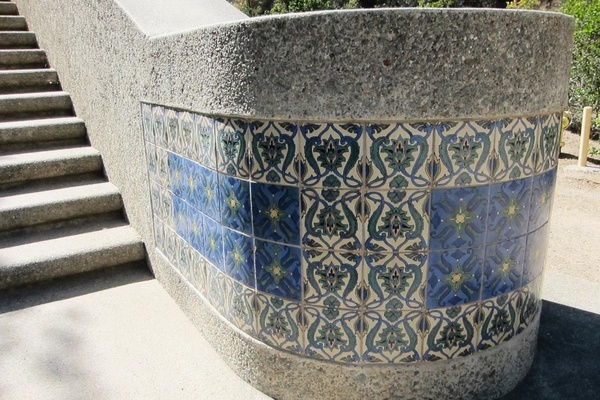 Unmatched pieces of tile are integrated into benches, fountains, and other parts of the built environment around town. Much like spotting shards of ruins in ancient Roman sites, the casual randomness is part of the charm. Avalon Seafood on the pier. 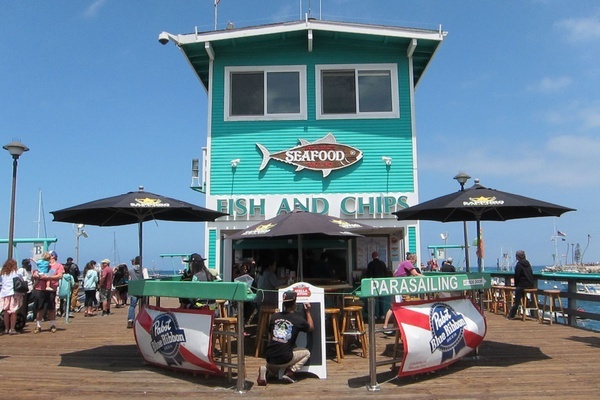 It's the general rule of oceanfront locations that when in doubt about where to eat, you head to the pier. Catalina is no exception. Eric's on the Pier (2 Green Pier; +1-310-510-0894) in Avalon is the classic burger joint. A plate of fish 'n' chips or Hawaiian-style marinated tuna poke at feels like the right way to refuel when perched a few feet above the Pacific tide. Locals crowd and out by the country club. It's hard to mistake for anything other than the old-school classic dive that it is. Speaking of old-schol, it's red-checkered tablecloths galore at . Strong margaritas that come with the freedom of being on a (mostly) car-free island and endless chips and salsa are the order of the day at . , an outpost of the Orange County-based chain, serves a solid menu of sustainable seafood and American classics located on what was once an historic dock. If manager Gerry Bravo is there, ask him to share his insider islander knowledge. is the Island Company's upscale American bistro, where dark wood paneling lends a clubby but still breezy feel. Take a flat walk along the shore or take advantage of shuttle service to to escape Avalon for a meal out on Pebbly Beach Road. Photo courtesy of Hotel Vista Del Mar. It's a shame that Catalina's rich aesthetic heritage didn't spill over to the hotels: Hospitality designers seemed to have turned to a Tommy Bahama-influenced flavor of island vibe instead. and are both better suited to deluxe romantic getaways than family holidays. The updated works for couples and families who can share space but have their own beds in a convenient (but for the flights of stairs) family suite. bills itself as the island's boutique hotel, but it's not as cool as it should be. Of course The Island Company has its own options. feels closest to a conventional hotel with rooms that face a landscaped courtyard. (I just hope its relative lushness isn't coming from freshwater sources. It's years late embracing sensible, drought-tolerant plants.) The historic William and Ada Wrigley estate has been recently renovated and is now the six-room . operates boats from the L.A. County mainland ports of San Pedro and Long Beach to Avalon and Two Harbors. Boats go from Dana Point in Orange County to Avalon. Fares are about $75 for adults and $60 for children during the summer. You can ride free on your birthday (if you have proof that it's the exact date). Alternately, make friends with sailing enthusiasts. Jessica is a freelance writer and historic preservation consultant living in Los Angeles. She is also the founder of , a restaurant and food news blog for young families. You can follow her on Instagram at . She travels for the food, design, and characters.